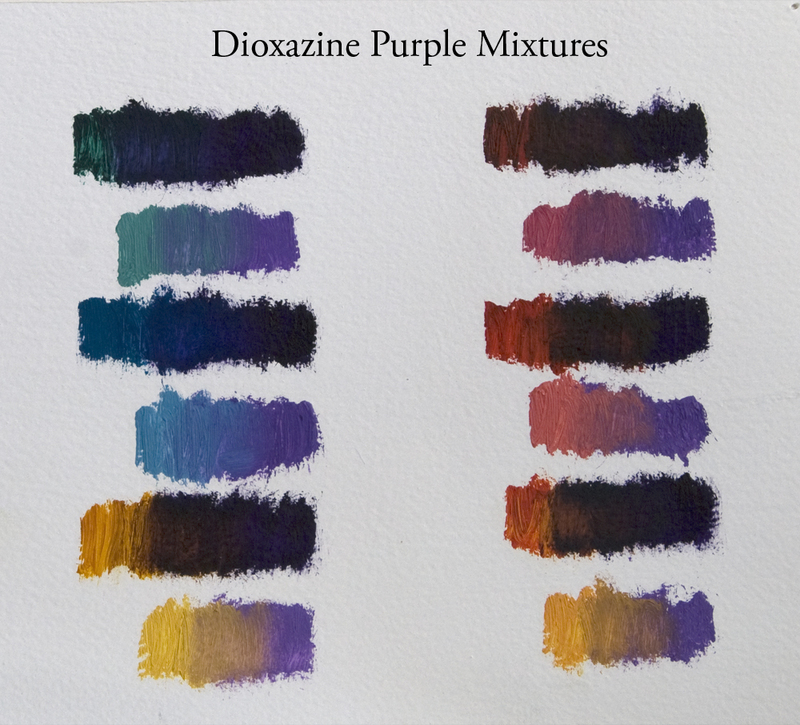 Today, I want to share with you some of my favorite paint mixtures with Permanent Alizarin Crimson, and in this post I will also share how very flexible this color is, by being able to mix well into dark neutrals, middle value saturated or desaturated colors, or bright highlights, all depending on the amount of white you use. A few months ago, I came up with the idea of creating a series of blog posts that cover some of my favorite paint mixtures, for days like today, when I do not have a new painting to share, because I still want share my love of art and how it is integrated into how I see the world. 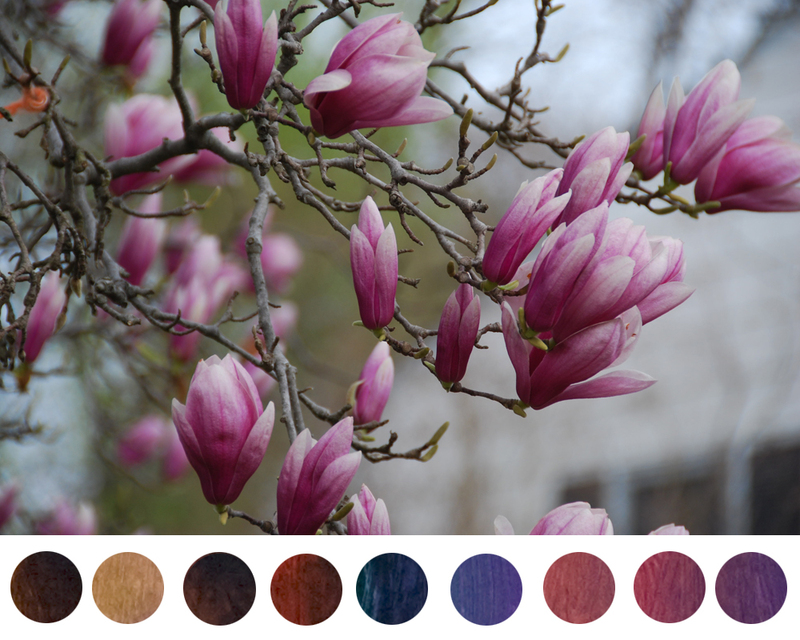 Here are three scenes that all can have mixtures of alizarin crimson incorporated into them, if I were to paint them. One of the amazing side affects of mixing aliz crimson with a warm yellow, like cad. yellow lt, is that immediately the saturation of the two colors gets knocked down some, where when mixing aliz crimson with cad red the color becomes more full, enhancing the colors without losing any need for more saturation. 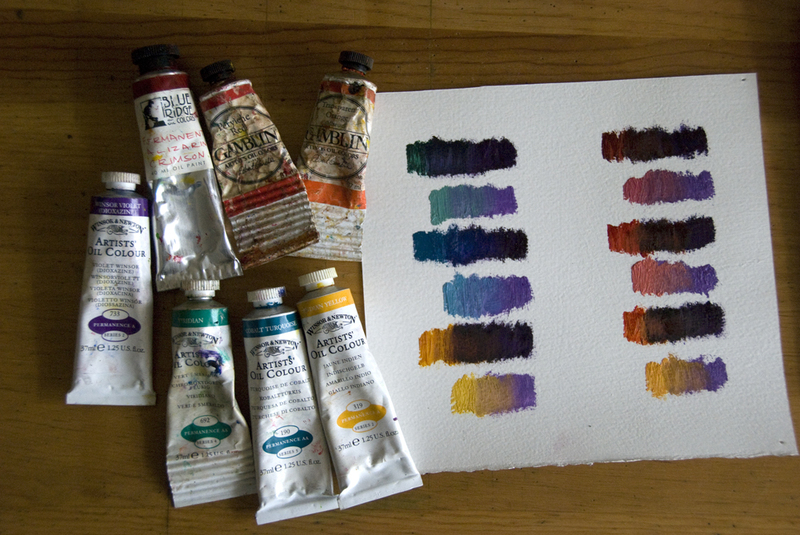 I love alizarin crimson for how versatile this pigment is. 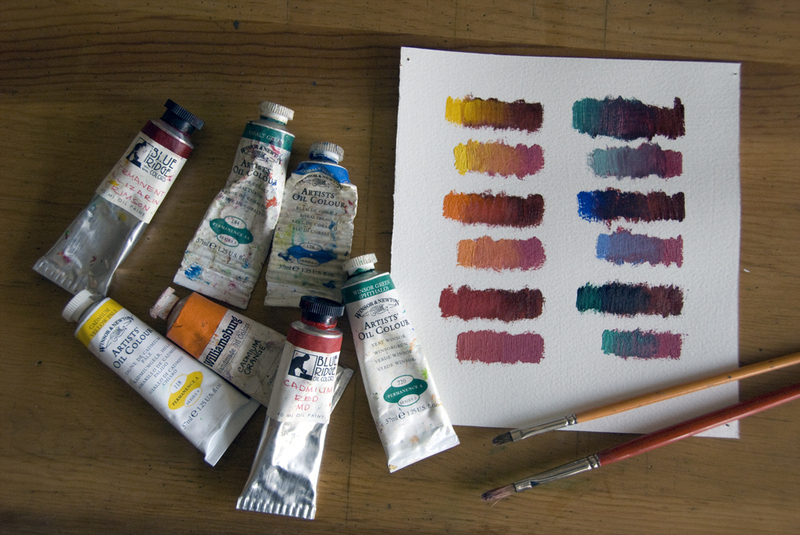 Alizarin crimson is a transparent, cool, brilliant red, that has a strong staining characteristic, so it mixes well with other transparent pigments and also with opaques. 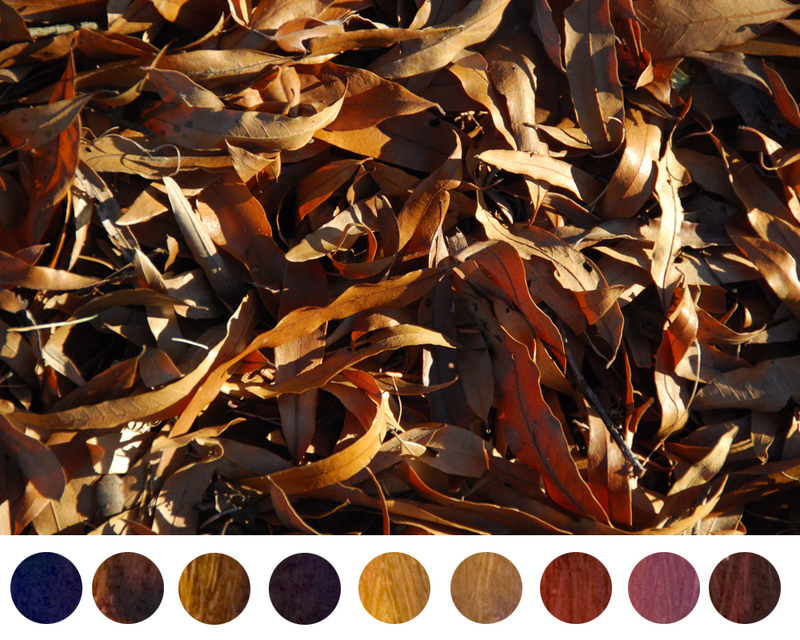 In fact I really love some of the colors that result from mixing it with opaques like Cad. Yellow or Cad. Red, because you get a really rich, full bodied color that has strong covering attributes while also incorporating some of the subtleties that arise from working with a transparent color. I use Permanent Alizarin Crimson made by Blue Ridge Oil Colors because I love how long this paint stays open compared to Winsor & Newton's version that will develop a skin within one day. 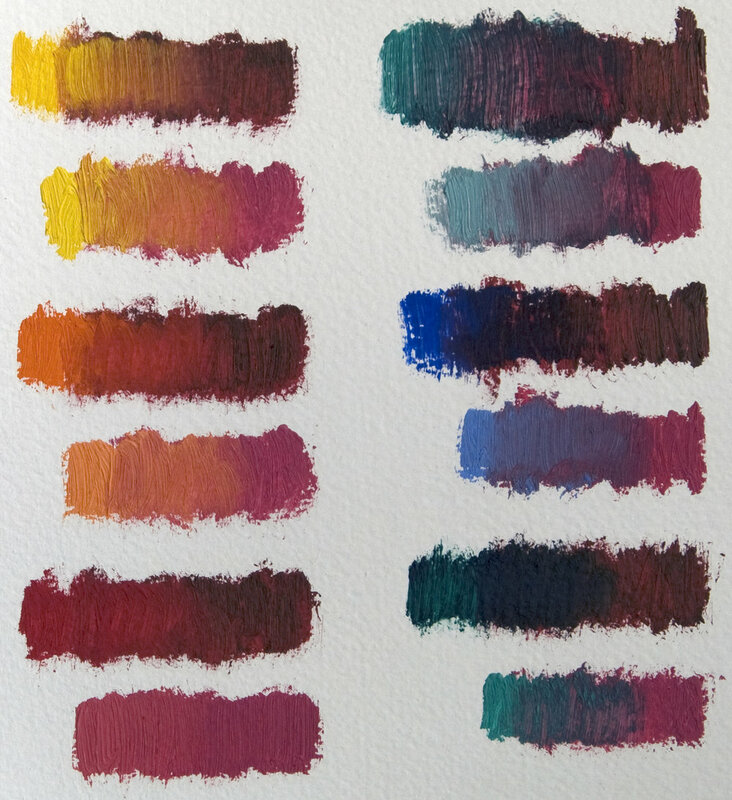 Also it is always a good idea to pay the extra money for the "permanent" version of this paint because the regular alizarin crimson is a fugitive color and will oxidize towards a brown red eventually. Lately I have been experimenting on different painting surfaces, super smooth linen, gessoed paper, gessoed masonite panels, and super rough linen, and for this painting I selected a burlap-like alkyd primed linen from New York Central Art Supply. I have worked on this type of surface before and really enjoy the variety of effects you can achieve with it by varying the thickness of paint applied and using different types of brushes or palette knifes. The flowers were painted in several layers, initially with paint thinned with medium using a sable brush to get into all the groves, once this layer setup I would go back into some areas to build up the paint to give a better sense of dimension. For areas of the jar and bird nest, I laid in a thick layer of paint and smoothed out the surface texture of the canvas with a palette knife. Specifically I wanted the central part of the jar to be smooth so the impression of glass would be better conveyed, and in the bird nest I wanted the areas that were deep in shadow and the egg to have a smooth base. 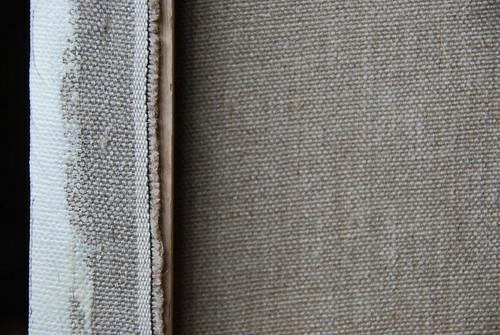 By smoothing these areas out made it easy to get a new surface texture so when I would scumble paint across those areas it would be a different affect than when I would scumble across the canvas where the rough weave was still present. PS. Naomi is 2 months old today! Today I did not go to the NGA to work on the copy, instead today I stayed home working on a variety of loose end and I thought it would be nice to share with you a new graphite drawing that is still in progress. This drawing was begun drawing from life, the roses have long since withered and faded, however I still think certain areas could be improved in value to strenghten the composition. So I am playing with it some, on Saturday I worked on some areas, darkening the values on some leaves and now it is leaning against a wall for me to observe it more to see if it needs anything else. Here are a few close ups of the tools I am using. When drawing with graphite I prefer using lead holders and I only like using "Turqouise" brand lead, as it is the smoothest and most reliable level of hardness. I use 2H, HB, 2B, 4B, and 6B leads. This drawing is on handmade Twinrocker paper, Yale Wove Text weight. It is my first time using this paper, before I had been hesitant to pay almost $10.00 for a single sheet of paper, now I am converted, the texture of this paper is fantastic. 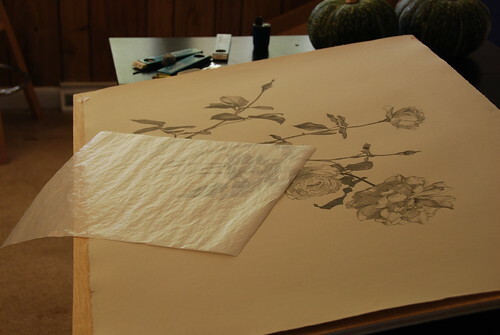 The fibers are strong and durable, so you do not ruin the surface of the paper with erasing, even with a hard rubber eraser. I use two lead holders usually, one that always has a harder lead and one that has a softer lead, that way I can go back and forth without changing leads every few moments. I like to use a kneaded eraser for most of my eraser needs, however there are times when I need something more powerful and that is when I use the fine grained rubber erasers, this eraser paired with the eraser shield helps me localize a specific area. It can be a real life saver, especially when you accidentally drop the lead holder on your drawing and it leaves a big ugly mark! When drawing with graphite I try to work left to right, top to bottom, to minimize smudging, however in the later stages of a drawing where I am reworking and refining areas I find having a sheet of glassine is helpful as it will not smudge the graphite. This drawing is a method Robert developed where you use verithin colored pencils to create the sense of trios crayons of yester-year. It is now very difficult to find quality artist grade red chalk, so by using terra-cotta verithin pencils on prepared paper you can almost create the same effect. For the three colors I used terra-cotta and black verithin pencils and a white pastel pencil for the highlights. It is a fun method of modeling and using warm and cool tones to develop the shadow shapes. 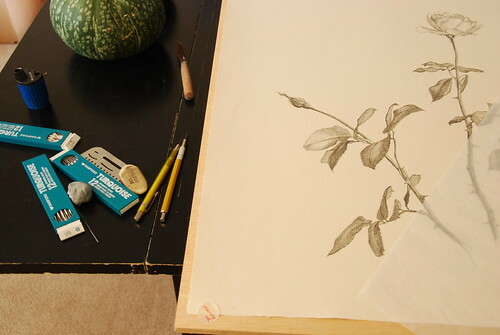 This drawing was completed over three sessions. Tomorrow in class we are working with silverpoint. I think it is my favorite drawing medium next to charcoal (which to me is more like painting) where with silverpoint it is all about the lines. It is all about draughtsmanship and integrity of line and form, and that is what I admire about it so much. 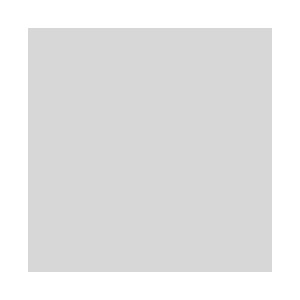 Here is a link to a modern artist that works predominantly with silverpoint. I think the current pose is for two more weeks and once it is done I will share it with you. Until next time, have a wonderful evening. When I have extra pieces of primed linen that are too small for stretching on canvas I will sometimes glue it to 6" x 6" masonite panels. 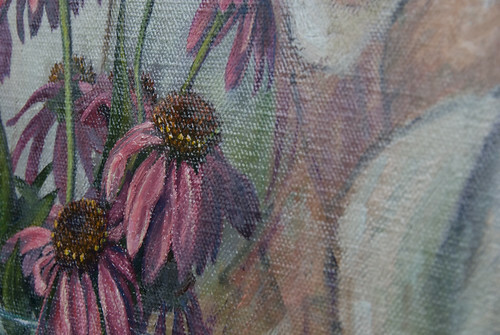 This gives me an opportunity to paint on linen and take advantage of the positive textural influences of this support. I use “Yes Paste” as my adhesive because it is acid free and dries quickly. This orchid is a part of a larger setup I have been working on, and after attempting to paint it several times in this other painting it became clear to my sanity that I needed to take some time and just focus on it. 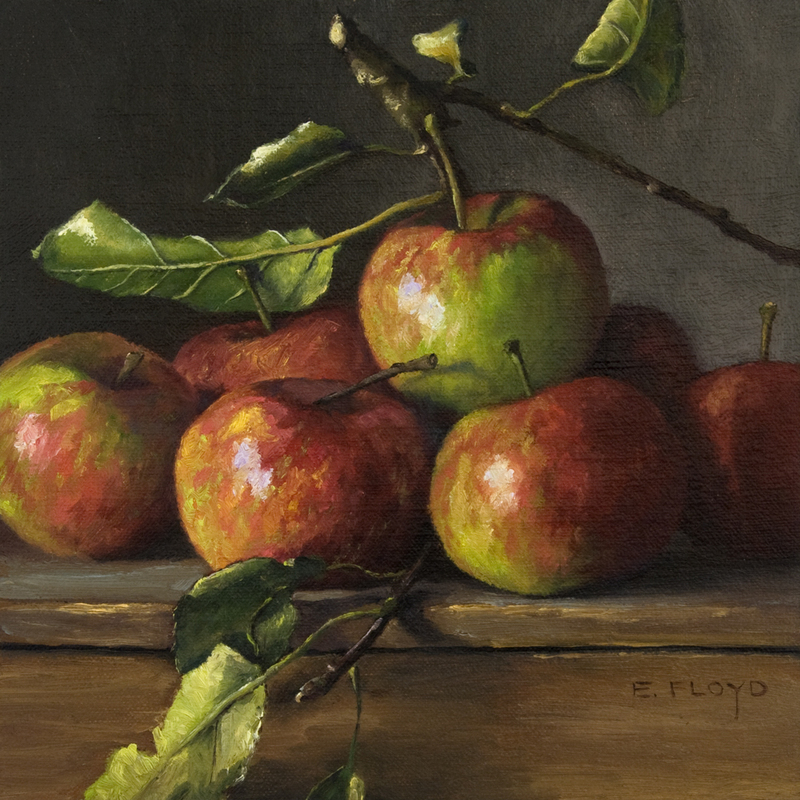 Separate from the other objects in the still life and becoming the focus of this daily painting. Now I can go back to the larger painting and capture it with a better sense of how to proceed. I do this often, if something becomes too much and I begin to overwork an area, I will then focus on specific parts, sometimes completing other paintings or sketches in order to better comprehend the object but also to investigate the what and how I am trying to achieve. In my experience paintings flow and creativity abounds when comprehension is at its highest, it allows me to feel free in experimenting and also to work in a heightened state of energy. It has been awhile since I did any mixed media collage that included more than just paper. With this little package of goodness, I may decide to dabble some. Thank you Lobster and Swan! This being said, I was feeling pretty awful and did not have the energy to stand and paint at my easel today. So instead I sat in a chair and did some watercolors. It has been awhile since I last painted with watercolor, so I experimented with different techniques and color applications. The top gourd was my first attempt. In this one I started pretty much like I start with oil painting, applying the general local colors and developing from there. The middle gourd was the next painting completed, where I was just playing with colors and color theory. 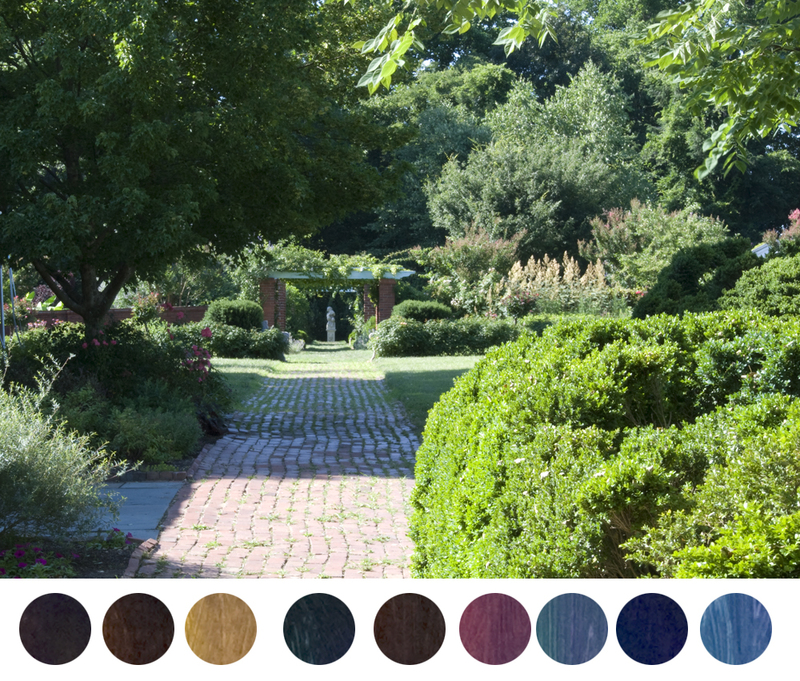 This one was based on the yellow-purple complementary palette, and then I would lay in other colors just to see how they would glaze over the previous layers. The bottom gourd was the last sketch, where I worked with glazes of pure pigment. 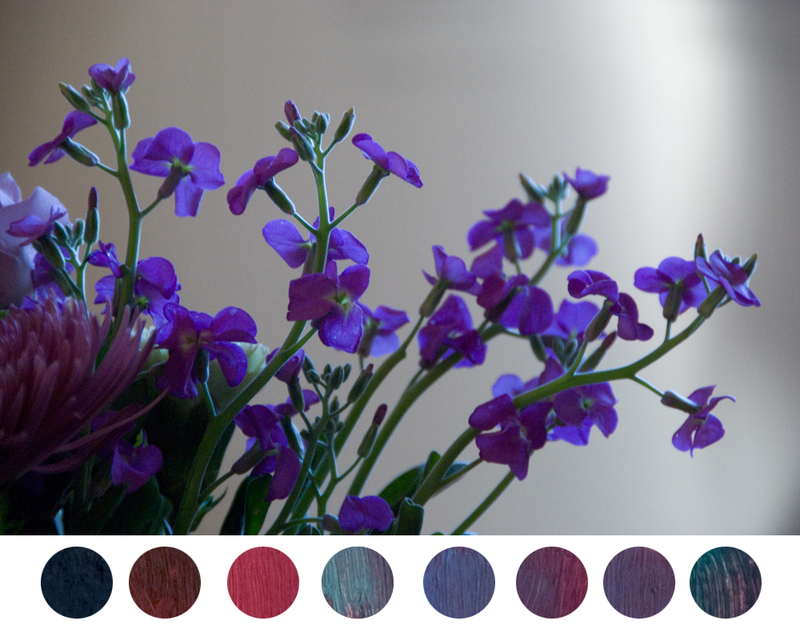 No color mixing on the palette occurred. I started with a cad yellow in the light areas and cerulean blue in the shadow areas. The later color variations came about laying glazes of different colors, I used some viridian, pyrrol orange, with Prussian blue and quinacridone rose in the shadow. It was a rather pleasant way to spend the afternoon after the trauma of the morning. Graphite on sketch paper 80lb. This being said, unfortunately I do not have a current painting or sketch to upload. This pencil sketch was completed a few years ago when I was trying to decide if I prefer sketching with a mechanical pencil, lead holder, or a regular pencil. So this drawings was completed with 2B & 4B leads in the various methods. 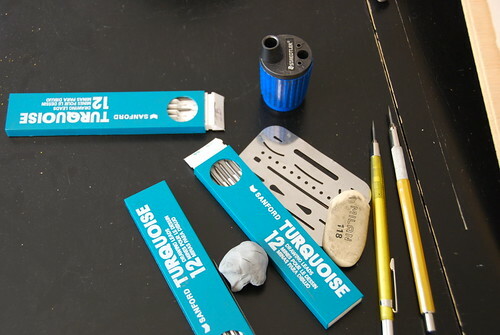 I have since decided that when using graphite, I prefer using a lead holder and selecting my lead hardness from the various Turqouise leads available. I like how with a lead pointer one can get a super fine line, and if you twirl the holder while drawing a line, the point can stay for awhile. I also like the sustainablity of it, I only need one lead holder and a container with the various leads. Later this week I will probably post some more sketches and thoughts, I just cannot guarantee any new paintings for a bit. I am working on building a website and some other "back of house" projects that require time and effort, they just do not show visible results with postings on this blog. Please be patient, and I expect by the first week in September all the end of summer goals and tasks will be completed and I will be back to making paintings and postings. I am working out in my mind a new larger still life composition (16 x 20 inches) that will include eggs in it. 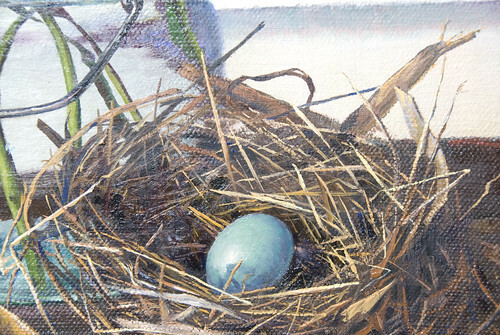 Several months have passed since I last painted an egg, so this painting was practice to get back into it and to investigate the level of detail and finish I will incorporate in the larger painting. Again I worked predominately with sable brushes, all cats tongue filberts by Escoda. I just ordered some round synthetic brushes to experiment with, so I expect my next few paintings will be completed with the new brushes. What is your favorite brush brand and what type of shape do you prefer?